With his ideologically driven "cut now, think later" austerity agenda the Tory Chancellor George Osborne is making a mess of running the UK economy. You don't have to take my word for it, the economic data speaks for itself. Since becoming Chancellor in 2010 Osborne has driven a weakly recovering economy back into recession (despite the injection of £200 billion into the financial system via the Bank of England's Quantitative Easing financial doping scheme). The UK has suffered three consecutive quarters of negative economic growth and the UK economy is actually smaller now than it was when he took over. Even right-wing neoliberal cheerleaders like the IMF have admitted that Osborne's economic strategy is failing. What makes this so remarkable is that the Tories have pumped £40 billion into IMF coffers and the IMF are always very reluctant to criticise their creditors. Even loyal Tory demographics are beginning to question Osborne's growth strategy, with several influential business groups calling for a change in policy to stimulate growth, exactly the same kind of people that wrote to the Telegraph in 2010 to applaud Osborne's barmy "cut-our-way-to-growth" strategy. That he is the most unpopular minister in an extremely unpopular government, which includes appalling characters (like Iain Duncan Smith and Jeremy Hunt) is a clear demonstration that a good proportion of the public also recognises that "Osbornomics" is failing, A poll in September 2012 revealed that his approval rating had reached an incredible minus 42%, (58% of people think he is doing a bad job offset by only 16% of people that think he is doing a good one). One of the things that infuriates people the most about Osborne's inept performance as Chancellor is his constant reliance upon feeble excuses. At first he stuck with the simplistic Tory mantra, the constant repetition of "the mess that Labour made" even though anyone but a half-wit could recognise that the "credit crunch" was actually a global economic crisis. Over time Osborne has added a number of other excuses such as "the Eurozone crisis", "the Jubilee", "the cold winter", "the wet summer", "the Royal wedding", "fluctuating commodity prices"... Whatever the excuses for the staggeringly poor economic performance there is one that the public will never hear; "I'm just a massively over-promoted rich boy who is completely out of his depth". 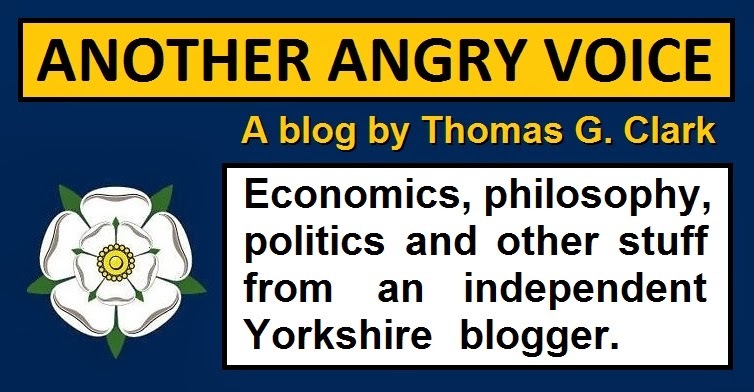 The thing that infuriates those of us that understand a bit about economics even more than Osborne's reliance upon pathetic excuses, is his outright abuse of economic evidence to justify his economic policies. The worst example is his near constant repetition of the narrative that the low cost of government borrowing is evidence that "the markets" support his economic policies. "Our policy has got the deficit down by 25%, it is every single day delivering in the World bond markets record low interest rates for this country, which shows that it has credibility"
It is undeniable that the yields on UK Treasury bonds have reached all time lows during Osborne's tenure, however any claim that Osborne's fiscal policies are the root cause of these low borrowing costs is stunningly fallacious example of ignoring the evidence. There is so much evidence that the low cost of borrowing is effected by other factors it is difficult to know where to start. Firstly we'll start by thinking about a correlation. 1. The cost of government borrowing has reached all time historic lows several times during one of the worst prolonged recessions in modern British history. 2. The Bank of England has been holding the base interest rate at the lowest level in British history (0.5%) for over three years. Does anyone seriously believe that 1 & 2 are completely unrelated and that the unprecidented low cost of borrowing can actually be ascribed to Osborne's fiscal policies rather than the Bank of England's unprecedented monetary policies? When you answer the question try to remember that Osborne's deficit reduction plans are widely criticised fiscal policies that many people believe are responsible for the economic stagnation of the last two and a half years. Next we should consider who are amongst the principle buyers of UK government debt. Since 2008 the Bank of England have "magicked up" £375 billion via Quantitative Easing to invest in buying up UK government debt for cash in order to "create market liquidity". Does anyone believe that such a vast intervention in the bond market wouldn't have the effect of driving down bond yields? I'd say that the ultra-low interest rates and the vast Bank of England QE interventions alone are convincing evidence to make a stand-alone case that the low cost of borrowing has little to do with Osborne's barmy fiscal experiment, and everything to do with central bank monetary policy, however I'll continue with the argument just to hammer the point home. Even discounting the massive effects of central bank monetary policy, it should be considered that Osborne's theory that high confidence leads to low yields is actually backwards. If long term bond yields are extremely low, this actually suggests that potential UK investors have little confidence in the wider UK economy. If they did have confidence in Osborne's fiscal strategy then surely they would invest in stocks and shares in the expectation of economic growth, increased productivity and increased profits, rather than stuffing their wealth into government bonds with extremely low yields. The fact that they choose to invest in safe, low return bonds rather than investing in the wider economy is actually a clear demonstration that they have very little confidence that Osborne's fiscal policies will lead to any kind of long-term economic growth. It is absolutely clear that international capital has been searching for safe havens from the economic chaos of the last five years. No investor with a grain of sense has failed to lose a great deal of trust in the financial markets after the global meltdown, especially considering the abject failure of regulators to punish those responsible for creating the economic crisis by spewing toxic sub-prime junk into the market slapped with glowing AAA ratings from the ratings agency oligopoly. If the financial sector robbed investors once, went completely unpunished, and the industry remains almost entirely unreformed; then there is obviously nothing to disincentivise them from doing exactly the same again; hence sensible investors should be scared. Capital is also fleeing several austerity riddled European economies too. The scale of capital flight out of Spain and Greece is unprecedented. All of this "fear capital" has to go somewhere and UK government debt is considered one of the few remaining safe options, given the extremely low probability of a UK debt default and the willingness of the BoE to "magic up" money in order to buy the bonds back for cash. If Osborne's fiscal policies of mindless austerity (mainly welfare and capital spending cuts) were really creating confidence, one would expect other austerity economies to be benefiting from low bond yields, however this is absolutely not the case. Spain and Greece are struggling to keep their borrowing costs below the 7% marker of complete unsusatinability. If we look at other economies that have been benefiting from similarly low government borrowing rates we come up with two very notable countries with significantly higher government debt ratios than the UK (or Spain!). The fact that the US and Japan have both been running their own ultra-low interest and quantitative easing policies gives credence to my first argument that the low cost of borrowing is a monetary policy issue rather than a fiscal policy issue. 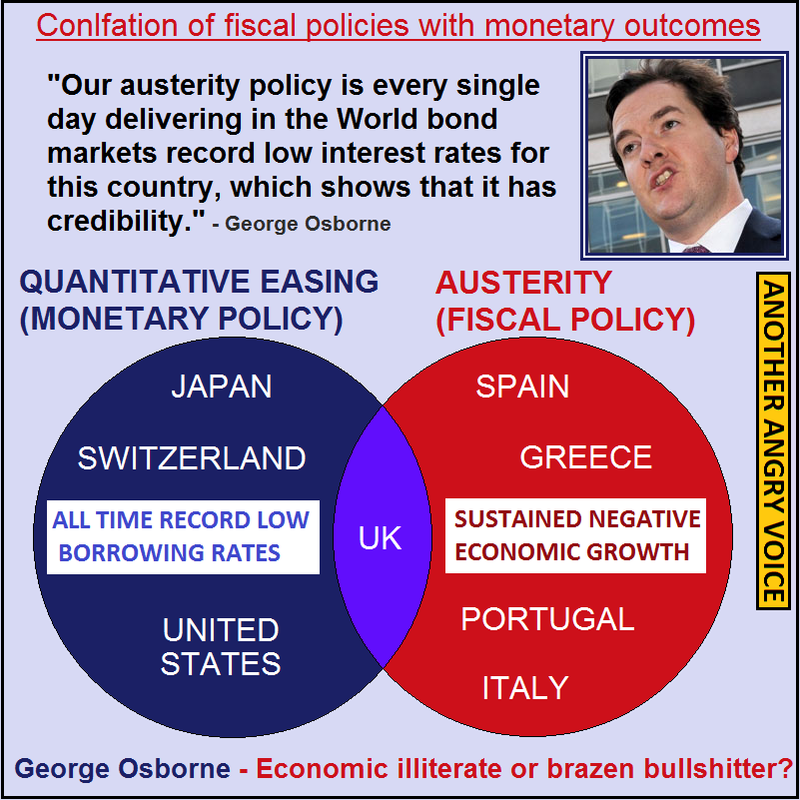 The fact that under Obama the US has largely avoided fiscal austerity and achieved a slow but steady economic recovery and maintained ultra-low bond yields blasts yet another hole in Osborne's "market confidence" theory and the fact that Japan has the lowest bond yields of all (often below 1%) despite having maintained vast government debts (currently well over 200% of GDP) for over two decades and run large deficits for most of that time should sink the Osborne ship of "market confidence" for good. 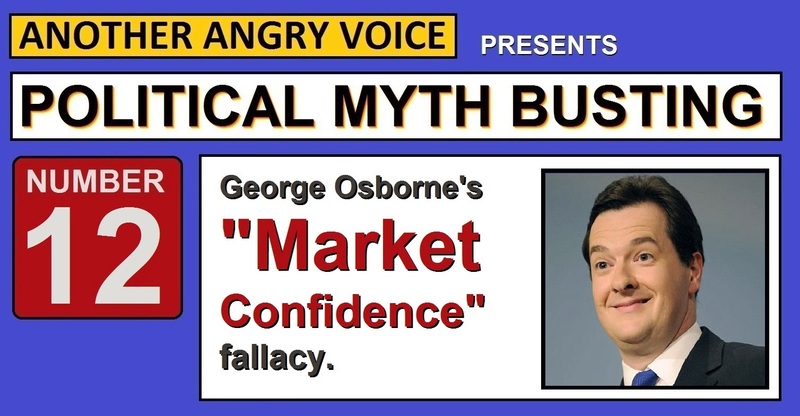 The fact that Osborne is talking utter rubbish every time he spouts this "market confidence" narrative is completely obvious to an untrained economist like me, which makes me wonder why the hell all the trained economists in the mainstream press are giving him such an easy ride when he trots out this economically illiterate narrative. They are essentially allowing him to get away with endlessly repeating what is either a demonstration of brazen economic illiteracy or a display of utter disingenouosness. Osborne claims that the low cost of borrowing is a demonstration that "the markets" are confident in his fiscal policies when they are actually a clear demonstration that "the markets" are mothballing their wealth in the safest assets they can find because they are petrified of risking it in the wider economy. The only elements of "confidence" displayed by this behaviour is a confidence that a UK debt default is less likely than elsewhere, and confidence that the Bank of England will continue to "magic up" cash to buy up their bonds, should they want to get rid of them. 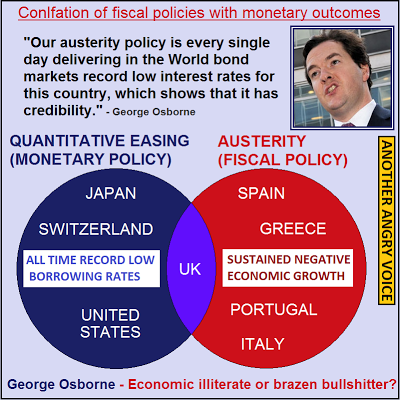 By repeatedly claiming that his socially and economically destructive fiscal polices are the root cause of the all time low cost of borrowing, rather than the Bank of England's unprecedented monetary policies of holding interest rates at an all time low for over three years and "magicing up" £375 billion in order to buy up government bonds, Osborne is either demonstrating that he is an economically illiterate idiot, or he is taking you for one.Another Angry Voice is a not-for-profit page which generates absolutely no revenue from advertising and accepts no money from corporate or political interests. The only source of revenue for Another Angry Voice is the PayPal donations box (which can be found in the right hand column, fairly near the top of the page). If you could afford to make a donation to help keep this site going, it would be massively appreciated.